Tahtib is a martial arts fight popular in the Sa’idi region for well over 3300 years. 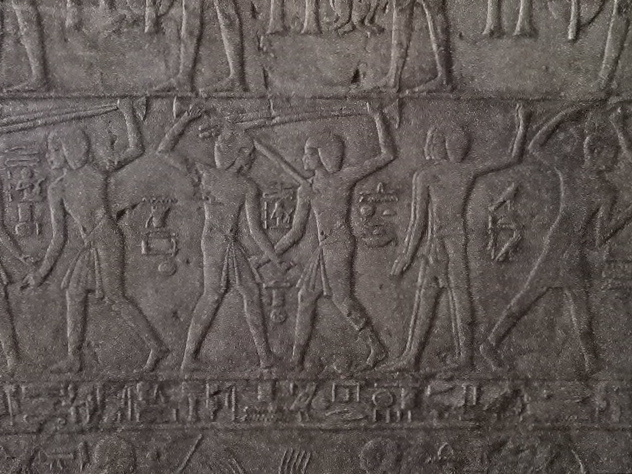 The photo above shows tahtib fighters as part of the Jubilee celebration of Amenhotep III, carved in the tomb of the noble Kheruef, whose mother was the main singer of Isis.¹ Amenhotep III, who ruled from 1386-1388 BC, was the father to Amenhotep IV who became Akhenaten. tahtib is the martial arts contest. The Sa’idi Tahtib has been a main interest of research for me since I moved to Egypt in 1989. In the Sa’id, and specifically in the Luxor/Qena area, the meaning and terminology is clear. When the two opponents are serious, such in the tournaments of moulid Abu Hagag in Luxor, Egypt the Sa’idi Tahtib is not a dance, it is a contest.4 In other more informal settings, such as a wedding, the tahtib is more playful, but is still a contest and retains the structure and the mutually understood repertoire of moves (similar to the parries of fencing). Tahtib contest tournament at the Abu Hagag moulid in Luxor, Egypt. June 2013. Photo by Sahra. In a performance setting such as a dance troupe on a stage, two men can perform a danced tahtib referring to the fight, but I have been told numerous times that this “isn’t really tahtib.”³ Stage performances are choreographed, tahtib is improvised contest. The Luxor Regional Governorate Troupe have dances in which danced versions of tahtib are displayed. Both National Troupes include Sa’idi Tahtib in their repertoire. Mahmoud Reda’s choreography featured in the film “Love in Karnak” is pivotal in the history of the acceptance of performed folklore. This rich subject will be the subject of another blog. The title says this serious tahtib is at a wedding. :00 Tahtib, :42 starting the second round of the contest then one of the opponents starts dancing solo to the band, 1:07 he gets serious and returns to the fight, 2:13 one opponent hands his assaya to the next player and at 2:39 the third round begins, 3:43 fourth round, 4:28 this time both opponents exit, two new contestants enter and after one of them salutes the band they continue the contest, 5:15 sixth round. According to Usama Salama5 who grew up in the Delta, the tahtib is played there and throughout the Nile valley by the Fellahin. I personally have never observed tahtib in Cairo nor in Bedouin areas. Upon leaving the Sa’idi region, the definition of tahtib becomes more complicated; in the United States and parts of Europe sometimes the designation of tahtib is substituted for what is actually raqs assaya. Many times I have asked the people of the Sa’id about this distinction, but receive the same frustrated answer each time. While the terms are very different in meaning in the region of origin, they have merged in the popular bellydance vernacular. While these terms are often used interchangeably, it is important to note the distinction both out of respect for the original forms of this dance, and for appropriate documentation of our dance form. ¹ “The Tomb of Kheruef: Theban Tomb 192” The University of Chicago Oriental Institute Publications, vol. 102, 1980. ³ Numerous interviews over 1989-2013, Sahra private collection. 4 Interviews during extended “tahtib” contests, Moulid Abu Hagag, Luxor Egypt. June 2013. Private collection. Great info Sahra. 😉 thanks!